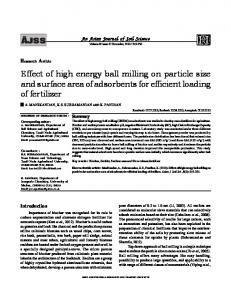 Aug 25, 2013 - decreased particle size after six hours ball milling of biochar and zeolite respectively and it reduces the particle ..... Time (h) increased up to 3 times whereas at minimum (400) rpm the .... Joseph, S and Cowie, A. (2010). in order to benefit the high rate of development in the lambs early ... Feed conversion was deteriorated in lambs group fed on low energy diet. The digestion. Aug 14, 2014 - Alexandre Augusto Cesario Asselli and Jacques Huot * ... to whom correspondence should be addressed; E-Mail: [email protected];. Tel. ... Sciences Ben M' Sik, Département de Physique, L.P.M.C,BP.7955, Casablanca, Morocco. ... Over past years, a large number of works [3- ..... B 21, 659 (1980). [2 ] R. Dingle, W. Wiegman, and C. H. Henry,. Phys. Rev. Lett. 33, 827 (1974). Jan 4, 2016 - after an overnight fast were included. 2. 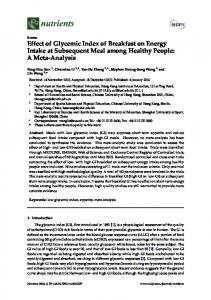 Methods .... fat, 0 g fiber, 238 kcal); White bread (42 g. aCHO ... Quick-cooking rice (50 g aCHO, 5.4 g.
1. Introduction Hard metals are composite materials with high hardness and relatively high fracture toughness, which offer high wear resistance. Therefore, they are used in industrial cutting tools and other applications where high wear resistance is required1. Some of these applications are cutting tools, dies and drills for oil and gas drilling2. The hard metal composites help to reduce costs and increase tool life compared to conventional steel tools. This composite is produced by powder metallurgy. Its properties depend on the composition, characteristics of the starting powders and manufacturing process. Therefore, the size, shape and distribution of the particles, the homogeneity of microstructure and porosity affect the mechanical properties of the material3. The high energy milling process is a mechanochemical synthesis in which the mixed powders of different metals or alloys are ground to obtain a homogeneous alloy, through mass transfer4,5. During the process, the particle powders are continuously deformed, cold welded, fragmented and re-welded. Currently, this technique is capable of producing composite materials, nanostructured materials, intermetallic compounds, amorphous solid solutions, among others6,7. High energy milling is greatly affected by a number of factors that play very important roles in the production of homogeneous materials 7,8. The powder properties, such as the particle size distribution, degree of disorder or amorphization and final stoichiometry depend on the milling conditions8. This study aims to investigate the influence of high energy milling on the characteristics of WC-20Ni powders and these powders on the sintered structure. grinding bodies (5 mm diameter balls) used are stainless steel and the ball-to-powder weight ratio is 8:1. Mixing was produced by high energy ball milling using an attritor mill, under argon atmosphere and 800 rpm speed. Powder samples were collected after different grinding times: 1, 2, 4, 8, 16, 32 and 64 hours. Particle size distribution was determined by laser diffraction using a Cilas 1064. Morphological and microstructural characterizations were carried out by optical and electron microscopy. Test specimens were made in a cylindrical die using a universal testing machine with a maximum capacity of 10 tonf to determine compressibility. The powders were uniaxially cold pressed in a cylindrical die at 300 MPa for subsequent sintering. Sintering was performed in a resistive tubular furnace in a flow argon atmosphere with heating rate of 8 °C/min to 800 °C and 3 °C/min to 1400 °C with an isothermal hold of 1 hour. Microhardness and density by Archimedes method of the sintered samples was determined. The microstructure of the sintered samples was inspected by optical microscope after being polished with diamond paste and subsequent etching (Murakami’s solution). 3. Results and Discussion 3.1. Powder characterization The SEM micrographs of the starting powders are shown in Figure 1. The WC particles exhibited morphology with faceted crystals and narrow particle sizes distribution, while the Ni particles have a rounded morphology with some agglomeration. 3.2. Powder morphology During the mechanical alloying process, the powders are subject to high-energy collision, which causes plastic deformation, cold welding and fracture of the powders9. In the first stage of milling, the ductile particles undergo deformation while brittle particles undergo fragmentation (Figure 2a) the brighter particles are Ni, while darker ones are WC. Figure 1. SEM micrographs of the starting powders a) WC and b) Ni. Figure 2. SEM micrographs of the WC-20Ni powders after ball milling for: a) 1 hour; b) 2 hours; c) 4 hours; d) 8 hours; e) 16 hours; f) 32 hours; and g) 64 hours. The brittle particles suffer fractures, which tend to refine them10. After 2 hours of milling, compared with the Ni particles, the WC particles decreased in size to form particles of about 6 μm, Figure 2b. After 4 hours of milling, the Ni powder had become flattened due to the impact forces exerted on the powder by the milling. The flattened particles undergo welding, while the brittle particles are distributed on the surface of softer material (Figure 2c). With increasing milling time, the capacity of particles to accept further plastic deformation decreases. As welding is the dominant mechanism in the process, the morphology of the particles changes to flattened particle agglomeration (Figure 2d and e). The last step of milling process involves the fracture of particles, and results in greater deformation and/or fragmentation of particles. With decreasing particle size fragmented, the agglomeration of particles increases, thereby increasing the resistance to fracture. The increase of fracture resistance and greater cohesion between the particles, with decreasing particle size, cause agglomeration11, Figure 2f and g.
Figure 3. EDS analysis for powders milled for 1 hour. The following graphs were obtained by EDS coupled to SEM to identify the elements present in powder particles after the milling. The Figures 3, 4 and 5, shows which in the beginning of MA does not appear the contamination with Fe. The Fe contamination was detected in the WC-20Ni powder milled for 8, 16, 32 and 64 hours (Figures 6, 7, 8 and 9). This is because this element is on the material composition of the vessel and balls, both of steel, which wear out during the process, due to subsequent collisions during the MA, contamination is a disadvantage of the MA using ball-milling. 3.4. Sieve analysis Table 1 presents D50 and D90 – D10 values related for these size distributions. D50 is the particle size at 50% of the cumulative curve and D90 – D10 expresses the extent of size distribution. With increasing milling time the particles decrease in size. However, if the milling is lasts longer than 8 hours, the particle size tends to increase, probably due to the formation of agglomerates during the milling. The wet milling, with PCA was used to reduce the aggregation of particles because the powder particles cold welding to each other during the MAE, but much of the PCA is vaporized by heating due to grinding and powder particle size may increase the amount of PCA is below a critical value12. Figure 4. EDS analysis for powders milled for 2 hours. Figure 5. EDS analysis for powders milled for 4 hours. friction between the particles, decreases material compressibility15. The hardening experienced by the particles during the milling process is also one of the causes of decreased material compressibility. With increasing milling time the hardening of the particles increases and the ductile deformation capacity is almost exhausted, causing a fracture and hampering its packaging. Table 1. D50 and D90 – D10 values for particle size distributions of WC-20Ni for selected milling times. Figure 6. EDS analysis for powders milled for 8 hours. Figure 7. EDS analysis for powders milled for 16 hours. Figure 9. EDS analysis for powders milled for 64 hours. Figure 8. EDS analysis for powders milled for 32 hours. Figure 10. Compressibility curves of the ball milled WC-20Ni powders. Figure 11. SEM micrographs of sintered samples prepared from powder ball milled for: a) 1 hour; b) 2 hours; c) 4 hours; d) 8 hours; e) 16 hours; f) 32 hours; and g) 64 hours. 1000× magnification, Murakami’s etching. separation of the grain boundaries and pores, allowing grain growth to start earlier in the sintering, resulting in a lower final density15. 3.7. Density The properties evaluated in this study are related to densification, an important factor in the production of materials obtained by powder metallurgy. Density of the sintered samples is given in Table 2. Relative density was seen to increase for up to 8 hours of milling, reaching 97% of theoretical density. The highest density for 8 hours of milling is in agreement with the micrograph shown in Figure 3d that presented a more homogeneous microstructure. After 8 hours of milling the relative density begins to decrease. 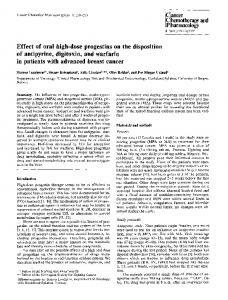 Decreased density is probably due to the poor sinterability obtained. 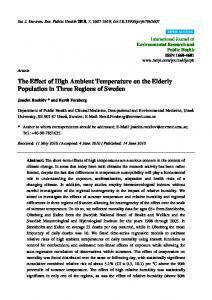 The increase in the milling time up to 8 hours did not increase the densification but had a detrimental effect. This is probably due to changes in packing characteristics of the powders during compaction, which were caused by increasing levels of deformation and hardening of the particles, and also because of the shape and size distribution of particles14,15. Table 2. Density after sintering. 4. Conclusion The milling time has a marked effect, both on shape, size and homogeneity of clusters. Powder contamination by iron due to wear of the balls occurred for milling times longer than 8 hours. The morphology and hardening influence powder compressibility. A varied particle size and flattened morphology increase compressibility, while a small particle size causes decreased compressibility for the composite studied, and increased milling time increases its work hardening. 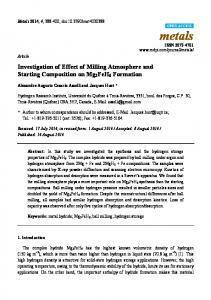 The milling time influenced the particle agglomeration. For 8 hours of milling the agglomerate was small, for 16 and 32 hours it was high and for 64 hours it decreased. This significantly influenced the sintering process as the powders with agglomerate particles make the sintering process difficult. Densification and hardness achieved better values after sintering for 8 hours of milling time, with 97.09% and 1058 ± 54 HV respectively. Long milling times, after 8 hours, had a deleterious effect on material properties. This was due to changes in packing characteristics of the powders during compaction, which were caused by increasing levels of particle deformation and hardening. References 1. Paggett JW. Neutron Diffraction Study of Load Response and Residual Stresses in WC-(Ni/Co) Composites [Dissertation]. University of Missouri; 2005. 2. Zhengui Y, Stiglich JJ and Sudarshan TS. Nano-grained Tungsten Carbide Cobalt (WC/Co). Materials Modification, Inc.; 1998. 3. Meyers MA, Mishra A and Benson DJ. Mechanical properties of nanocrystalline materials, Progress in Materials Science. USA: University of California; 2005. 4. Zeng F, Gao Y, Li L, Li DM and Pan F. Elastic modulus and hardness of Cu-Ta amorphous films, Jour. Alloys and Compounds. 2005; 389:75-79. 5. Costa FA, Da Silva AGP, Silva Jr JF and Gomes UU. Composite Ta‑Cu powders prepared by high energy milling. International Journal of Refractory Metals and Hard Materials. 2008; 26(6):499-503. 6. Lin C, Hong SE and Lee P. Formation of NiAl-Al2O3 Intermetallic Matrix Composite Powder by Mechanical Alloying Technique. Intermetallics. 2000; 8:1043-1048. 7. Hwang SJ. The Effect of Microstruture and Dispersoids on the Mechanical Properties of NiAl Produced by Mechanical Alloying. Journal of Metastable and Nanocrystalline Materials. 2000; 7:1-6. 8. El-Eskandarany MS, Sumiyama K, Aoki K and Suzuki K. Reactive ball mill for solid State synthesis of metal nitrides powders. Materials Science Forum. 1992; 801:88-90. 9. Suryanarayana C. Mechanical Alloying and Milling. Progress in Materials Science. 2001; 46:1-184. 10. Koch CC. Materials Synthesis by Mechanical Alloying. Annual Review of Materials Science. 1989; 19:121-143. 11. Hewitt SA, Laoui TE and Kibble KK. Effect of Milling Temperature on the Synthesis and Consolidation of Nanocomposite WC–10Co Powders. International Journal of Refractory Metals and Hard Materials. 2009; 27:66-73. 12. Kulov A and Gusev A. Phase Equilibria in the W-C System and Tungsten Carbides. Russian Chemical Reviews. 2006; 75:687-708. 13. Al-Quereshi HA, Galiotto AE and Klein AN. On the Mechanical of Cold Die Compaction for Powder Metallurgy. Journal of Material Processing Technology. 2005; 166:135-143. 14. Hewitt SA, Laoui TE and Kibble KK. Effect of Milling Temperature on the Synthesis and Consolidation of Nanocomposite WC–10Co Powders. International Journal of Refractory Metals and Hard Materials. 2009; 27:66-73. 15. Heckel RW. Density-Pressure Relationships in Powder Compaction. Transactions of The Metallurgical Society of AIME. 1961; 221:671-675. 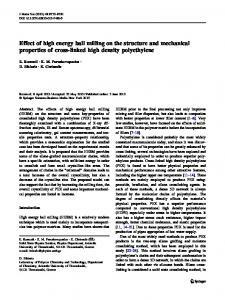 Report "Effect of High Energy Milling on the Microstruture ... - Semantic Scholar"